The new album How to live on nothing is out today on Digipack CD and digital (Europe only for the moment). Released on 3rd side records, you can purchase the 14 tracks LP in stores or via itunes. It'll be available next week in Belgium & Switzerland, and in Germany at the end of September. You can find the lyrics at the words page, tracklisting, artwork & credits at the discography page. A review of How to live on nothing on the french magazine Noise #17, another one on US webzine Blow the Scene. Check the fall tour dates at the tour dates page. TvB will be touring with Christian Omar Madrigal Izzo (from Chokebore!) on drums and percussion and Adeline Fargier Jasso on bass/keyboard. A great new TvB shirt, buttons and stickers will be for sale at the shows. The Troy Von Balthazar song I block the sunlight out is featured in the 2010 award winning surf movie "Fiberglass and megapixels". In 2010 book has been written and published in France. The rumour is that the main character is based on the life of TvB. A new place for TvB to keep things up to date: the TVBlog. Completely new site, new design, many new features such as syndication for news & tour dates, maps & hcal & ical utilities for the shows. New songs added at the audio page, and at the covers page. 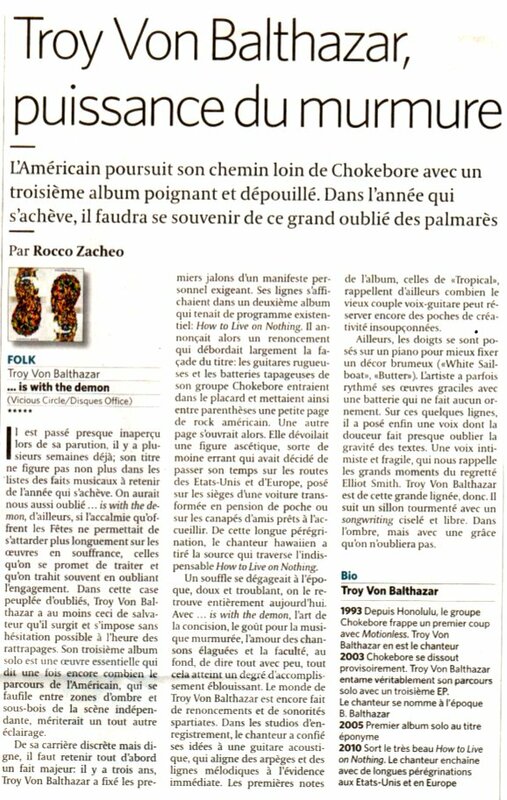 Troy Von Balthazar is reviewed in french on ResMusica. You can also find an interview of Troy on that same ResMusica, in french. Troy is playing 3 songs - an old one, a cover, a new one - on a video acoustic session on Dailymotion. Video by Europe and Co.
You can read the review of the book on Magic #126 (december 2008). You can now purchase it at Yvon Lambert Gallery's Bookshop / 108 rue Vieille du Temple / 75003 Paris, and still at Sinnbus shop. The book is now available worldwide through the Sinnbus records mailorder. A new interview in German on Musikexpress. A set of live photos of the Munich show on the Roteraupe gallery.